Ginna Hoben and James Keegan in THE FAIR MAID OF THE WEST. 2010. John Harrell in THE FAIR MAID OF THE WEST. 2010. 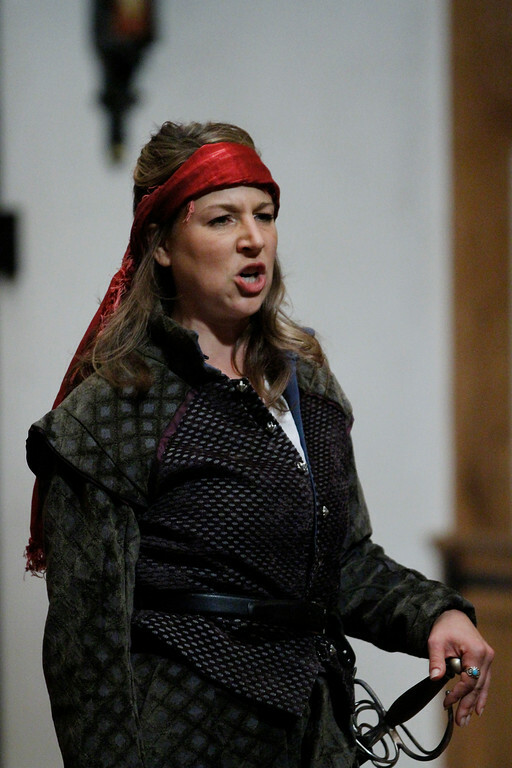 Ginna Hoben in THE FAIR MAID OF THE WEST. 2010. 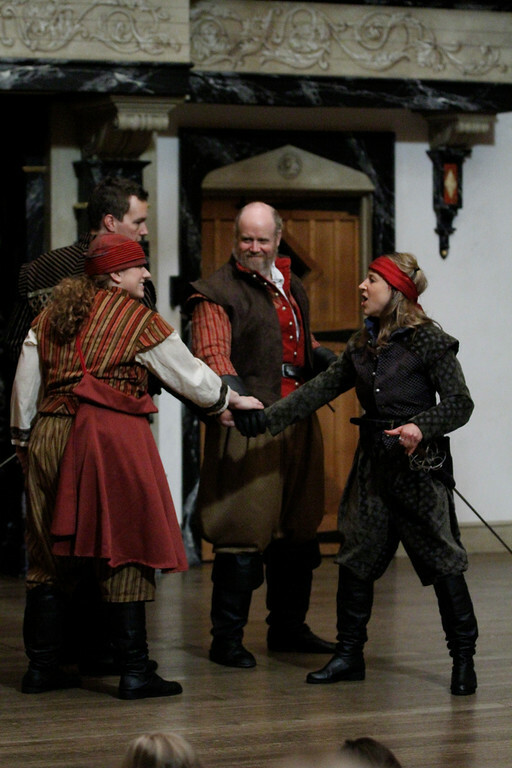 Allison Glenzer, John Harrell, James Keegan, and Ginna Hoben in THE FAIR MAID OF THE WEST. 2010. 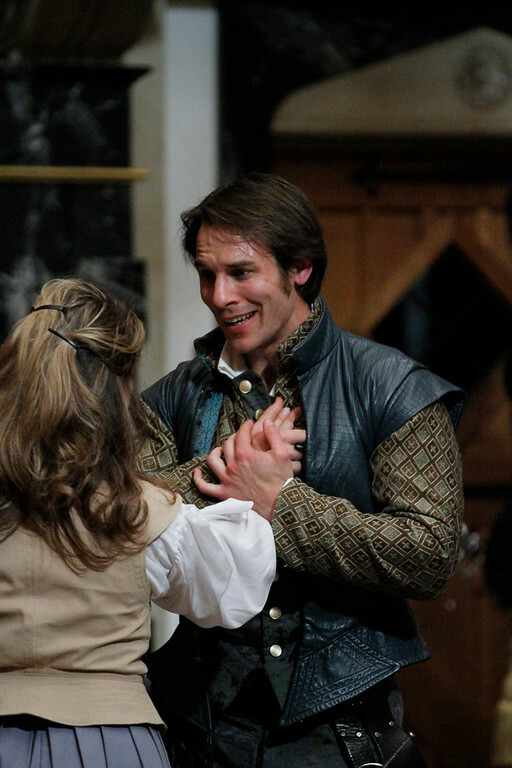 Ginna Hoben and Patrick Midgley in THE FAIR MAID OF THE WEST. 2010. 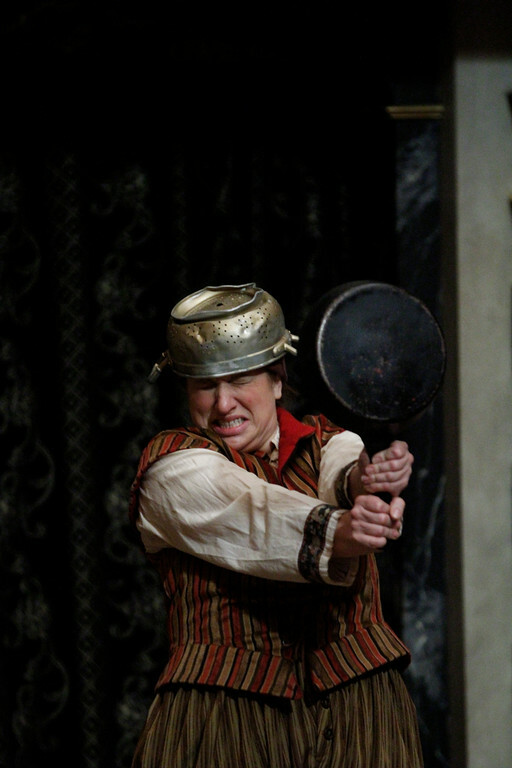 Allison Glenzer in THE FAIR MAID OF THE WEST. 2010. Ginna Hoben, James Keegan, and Allison Glenzer in THE FAIR MAID OF THE WEST. 2010. 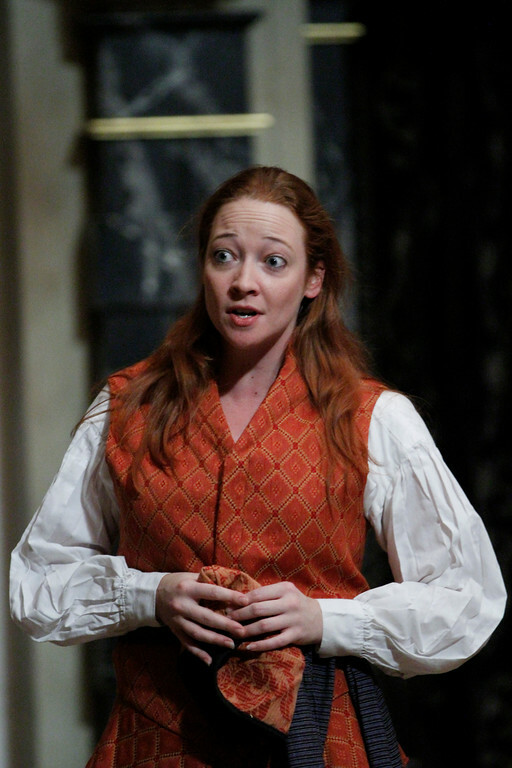 Sarah Fallon in THE FAIR MAID OF THE WEST. 2010. 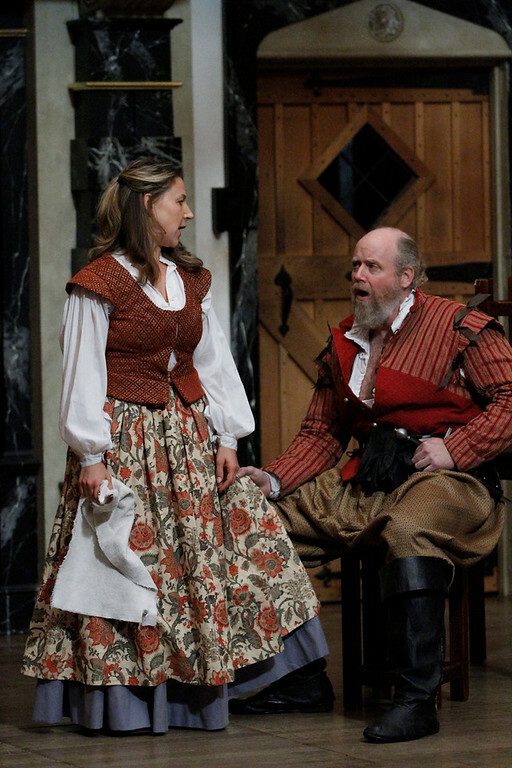 Ginna Hoben and René Thornton, Jr. in THE FAIR MAID OF THE WEST. 2010. 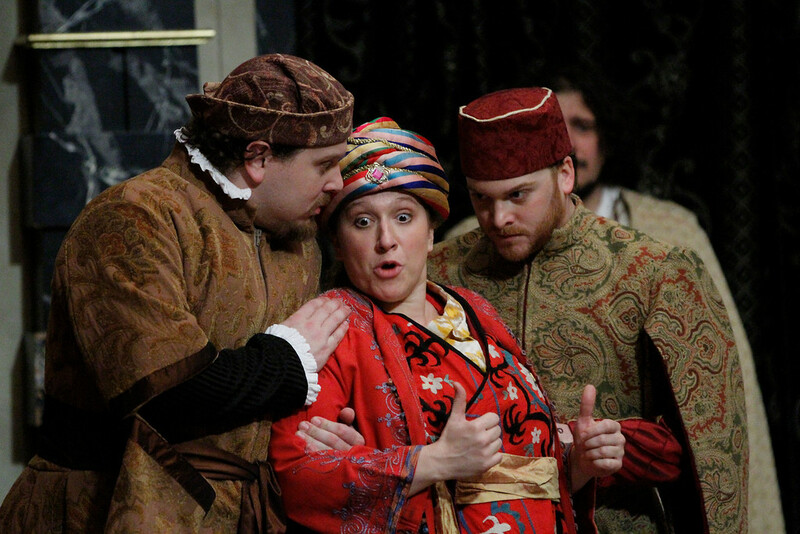 Benjamin Curns, Allison Glenzer, and Jeremiah Davis in THE FAIR MAID OF THE WEST. 2010. The English and the Spanish are at war. The chaste Bess Bridges works in a tavern in Plymouth, and many men have courted her because she’s beautiful and modest. Plymouth fills up with warring soldiers, one of whom, Carrol, insults Bess at work. Master Spencer kills Carrol and flees to escape prosecution. Spencer sends Bess to a tavern he owns in Foy. At the new tavern, called the Windmill, Bess meets Clem the clown and Roughman the bully who become her friends. Captain Goodlack returns from the war thinking Spencer has died and tries to disprove Bess’s chastity because Spencer has named her his sole heir if she remains chaste. Bess is triumphant and wins Goodlack as a friend. She uses the money to become a privateer (a pirate attacking on behalf of her country) who preys on the Spanish and Turkish with all her new hearties. Reunions, the King of Fez, and amazing adventures ensue. Almost 25 years ago, Trevor Nunn and the Royal Shakespeare Company reintroduced the world to this title when he conflated the two parts of The Fair Maid of the West into a single play. 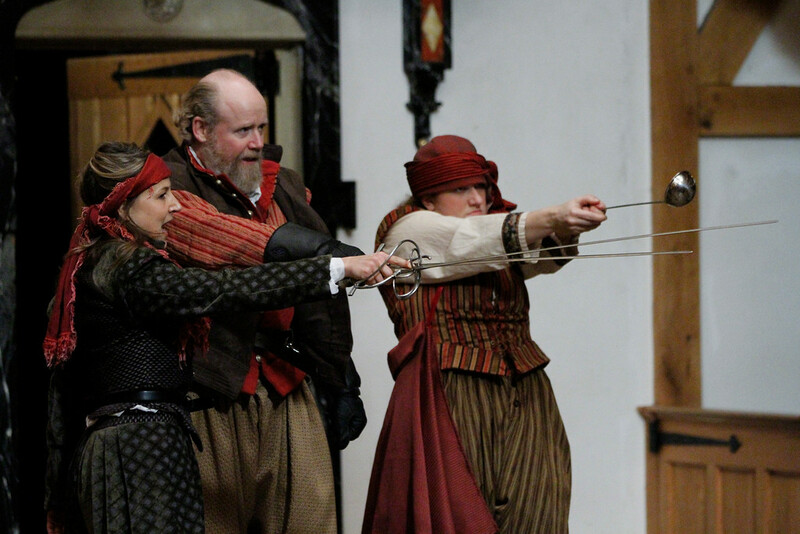 I saw the swashbuckling epic in London, and it was such a memorably fun night at the theatre that it left a lasting impression on me. As I looked hard at this play(s) for possible inclusion in an ASC season, I lumped Fair Maid of the West into a group of other plays that have seen their fair share of conflation. The end of this exploration left me utterly un-enamored with the idea of taking separate plays and squishing them together. I now have no interest in conflating Shakespeare’s amazing history plays – we’re in the middle of doing all ten of them individually (check out 2 Henry VI in our 2010 Fall Season and 3 Henry VI in our 2011 Actors’ Renaissance Season) – or blending both parts of Christopher Marlowe’s powerful Tamburlaine the Great (we’ll be doing Part 1 in the 2011 Fall season, but we haven’t announced that year of programming, so shhh! don’t tell anyone). I believe each of these magnificent plays provides more entertainment when staged separately. So why is Heywood worth our consideration today? Not only because of his whirling narratives and demanding dramaturgy, and not only because he was an entirely accessible, popular entertainer…but because in his adventure stories, he conveys a disarming innocence, an uncomplicated childlike directness…Bess is a heroine, like Indiana Jones is a hero, unambiguous and admirable. But (and this “but” is important), Mr. Nunn evidently didn’t think enough of Heywood to give us either of the real Fair Maid plays; instead, he gave us his own conflation that jammed pieces of both plays together in a way I now find completely unsatisfying. He cut small bits and great swaths from two plays that were written decades apart. He rearranged the order of many plot points and created a single production which was simply too much of a good thing (he also left too many good lines/moments on the cutting room floor). I now believe that Part 1 is simply too wonderful on its own to squish it together with Part 2. 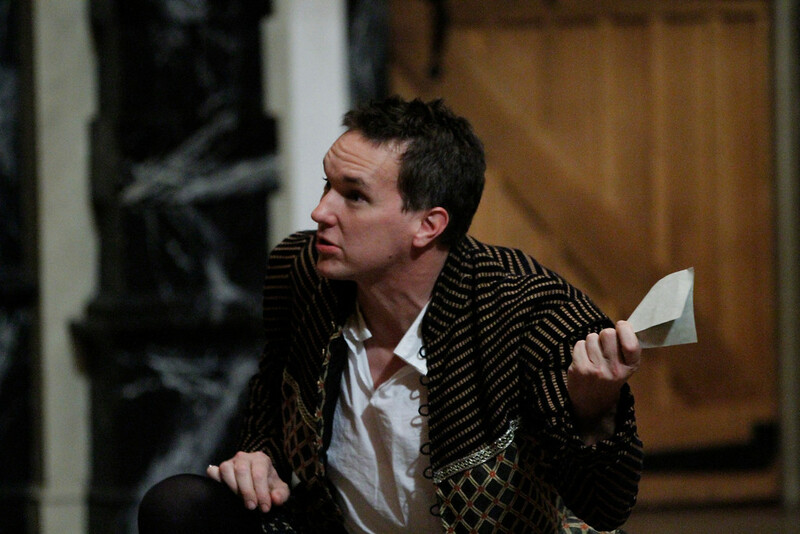 As well as staging great productions of Shakespeare’s plays, one of our other goals at the ASC is to rediscover early modern gems by other playwrights and share them with our audiences in our Bring ‘Em Back Alive Staged Reading Series and in fully-mounted productions. Shakespeare never really tried his hand at writing a romantic adventure quite in the vein of Fair Maid. Maybe Pericles or Cymbeline (both written near the end of Shakespeare’s career, around 1607-10) could be considered cousins, but Heywood’s Fair Maid has more of what we would call a “summer blockbuster,” pop appeal than either of these Shakespeare plays (which would be more at home at the Sundance Festival for independent films rather than your local mall’s multi-plex). Shakespeare’s Rosalind in As You Like It is probably the only female character put in charge of one of his plays in a way that compares to Heywood’s cross-dressing fair maid, Bess Bridges; and Bess beats Roz in some ways because she gets to beat up Roughman, wield a sword, and command a pirate ship! Fair Maid, Part 1 is a kind of fantastic fun that you don’t want to miss and that you’ll want to share with others.